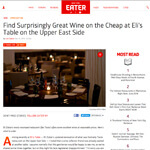 Eli’s Table is a casually elegant neighborhood restaurant and a destination for wine lovers, where local and seasonal—both hallmarks of Eli Zabar’s philosophy—come together beautifully. Boasting a wine list of over 22,000 bottles, Eli’s Table is widely considered one of the most exciting places to drink aged Burgundy, and Old World wines, in the city. 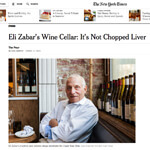 The focus at Eli’s Table, the restaurant attached to and inspired by the market below, turns to the classic fare New Yorkers have come to expect from the name Zabar: smoked fish, the city’s best French Toast, and a bottomless bread basket, all served in a relaxed, family-centric setting. The food at Eli’s Table is perfectly paired with a wine program focused on Old World wines with enough cellarage to assure perfect drinking. 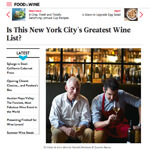 It’s a list that is heaven for wine geeks. The wine director, Kilian Robin, loves to surprise experts and induct novices with a wine service that is knowledgeable, approachable, and interactive.